Adobe has unveiled Flash Catalyst CS5, a new professional design tool that lets users create Web application interfaces and design interactivity without writing code. Together with Flash Professional CS5 and Flash Builder 4, Flash Catalyst enhances collaboration between designers and developers. Flash Catalyst’s main focus is on the components used to create interactive content—the buttons, scroll bars, sliders, text fields, and checkboxes that let users interact with a product or service. 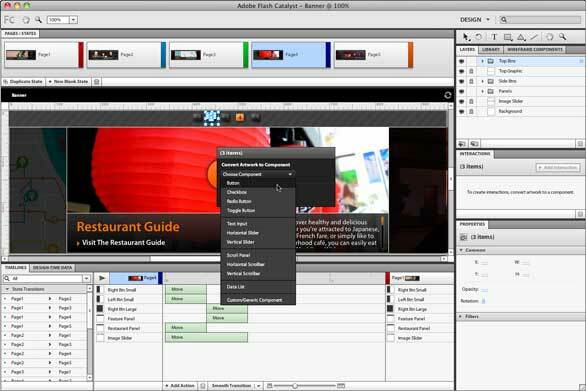 The program features a designer-friendly set of interface design features that will look familiar to users of Photoshop, Illustrator, Flash Professional, and Fireworks. It lets you build interactive designs using concepts like pages and states, resembling traditional print or Web design projects. With Flash Catalyst CS5, designers can add interactive Flash content to Web sites and applications by transforming Photoshop and Illustrator artwork or Fireworks files into functional content and user interfaces. Flash Catalyst also allows editing of structured pieces of an interactive project in Photoshop or Illustrator, and allows finished projects to be published as SWF files. Project files can be imported into Flash Builder where developers can add functionality and integrate them with servers and services. Flash Catalyst projects can be published as SWF or AIR files for viewing on the desktop or online, or for playback in the upcoming Flash Player 10.1. 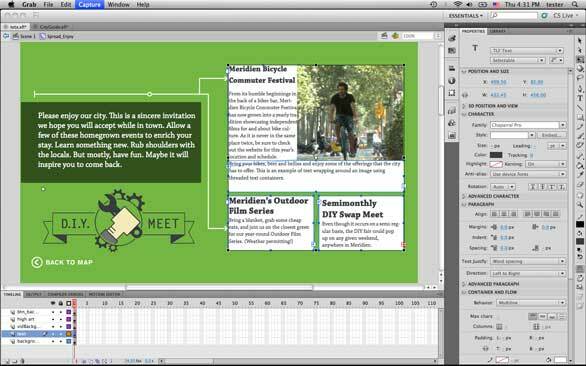 The Heads Up Display in Flash Catalyst CS5 helps you transform static artwork into interactive designs without writing code. Flash Catalyst CS5 is $399. It is also available in the Design Premium, Web Premium, and Production Premium editions and the Master Collection. It runs on OS X 10.5.7 or 10.6. Also new to the Creative Suite is Flash Builder 4 Standard (previously called Flex Builder), an Eclipse-based development tool that helps developers build cross-platform rich Internet applications (RIAs). It facilitates coding, debugging, and visual design for user interfaces. With Flash Builder 4, developers can better collaborate with Catalyst designers to build applications with specific interactions. This gives designers greater control over the creative aspects of a project, while allowing developers to focus on core application logic. Flash Builder 4 Standard is $249, with an upgrade price of $99. It also ships as part of CS5 with the Web Premium and Master Collection. A premium edition of Flash Builder 4 is $699, with an upgrade price of $299. Both versions of Flash Builder are available now. They run on OS X 10.5.7 or 10.6. Flash Professional is the program most familiar to designers for creating interactive multimedia, animation, and other rich content. The new text engine in Flash Professional CS5 gives you rich typographical controls, including threaded and multi-column text. Flash Professional CS5 offers a new Text Layout Framework, which provides professional typographic capabilities and advanced multilingual text and layout features for more than 30 languages. Also new is a pre-built Code Snippets panel, which allows designers to inject code into projects for timeline navigation, actions, animation, audio, and video. Using Flash Professional CS5, designers and developers can create, test and deliver Web content across a range of mobile platforms and devices such as smartphones, tablets, netbooks, smartbooks and other consumer electronics. They can deploy content in the browser with the upcoming Flash Player 10.1 and as standalone applications with AIR 2. The new version of Flash offers access to Omniture SiteCatalyst and Omniture Test&Target Web analytics tools from within the program and integration with new Adobe CS Live online services. The app also includes the Packager for iPhone tool, which was intended to let Flash developers craft apps for Apple's iPhone and iPad, and other upcoming mobile devices. The Packager for iPhone compiles ActionScript bytecode into native iPhone application code. Apple's new iPhone 4.0 Developer Program License Agreement, released on April 8, effectively bans apps not created in C, C++, and Objective-C. Nonetheless, Adobe has stated that it will continue to develop the Packager for iPhone OS technology and offer it in Flash CS5. Flash Professional CS5 is $699 with an upgrade price of $199. It is also available with the Design Premium, Web Premium, Production Premium, and Master Collection. It runs on OS X 10.5.7 or 10.6. Flash Catalyst CS5 and Flash Professional CS5 ship within 30 days. Both versions of Flash Builder 4 are available now.